Could Microsoft kill off the Surface in 2019? Microsoft will stop making Surface hardware when 2019 rolls around, at least according to the head of one analyst firm, and a big cheese exec at Lenovo. This claim emerged at the Canalys Channels Forum, where the chief executive of analyst company Canalys, Steve Brazier, noted that Microsoft had a lot of cost-cutting to do when it came to balancing the books, and that the “Surface will be the first target”. As the Register reports, Brazier noted that Microsoft’s CEO Satya Nadella is a ‘cloud and software guy’, and that Microsoft’s convertible notebooks would go the same way as its smartphones. He further added that bean counters and the denizens of Wall Street will question why Nadella has forged a path into a low-margin business here. Gianfranco Lanci, corporate president and COO at Lenovo, not only agreed with Brazier’s assessment, but felt Microsoft could shutter the Surface business even earlier than the year after next. So, what to make of this? Surface hybrids have always had their ups and downs – ever since Microsoft launched the first device back in 2012, which was hampered by its high price and operating system (Windows RT) – and the premium price tag is something which has never gone away. In recent times, we’ve seen a dip in Surface revenue, which was down 2% in Microsoft’s last reported fiscal quarter, and dropped a far more worrying 26% year-on-year in the previous quarter. Although that contrasts markedly with last year when sales became stronger, and indeed Microsoft was claiming its ‘best sales to consumers ever’ at the close of 2016. It’s a variable sales picture, that much is clear, although part of the reason for the drop certainly throughout the earlier part of this year might simply be the fact that a refresh had been due for so long (and it finally went on sale in June). But even if Surface isn’t making any money overall as Brazier claims, the line of hybrids isn’t just about filling the coffers. Indeed breaking even could be just fine, because the Surface products can be viewed not as a financial investment, but rather an investment in reputation. The idea has always been that Surface is there to show hardware partners what can be done with Windows devices, and to blaze a trail for the hybrid concept with Microsoft’s OS. 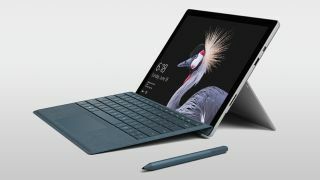 Something it has done very ably – just look at our review of the latest Surface Pro, which is a very slickly designed piece of kit. Also consider that to do away with the Surface line would be an admission of defeat when it comes to Windows hardware, and that’s certainly not a step Microsoft would want to take – a failure in the laptop arena, following a disaster with smartphone hardware in missing the mobile boat? Microsoft also appears to be trying to follow the Apple model with its retail stores, and is expanding on this front, with plans just revealed to open the first UK bricks-and-mortar outlet in London (next door to Apple, in fact). And of course, Microsoft needs some hardware to showcase in these shops. So you can talk about the cost of Surface hardware, but if the hybrids were canned, that’s a lot of reputational fallout to be dealing with – an equally damaging cost which might not hurt the coffers, but will potentially put a big dent in the Microsoft brand. These are all reasons why it seems a little unlikely to be talking about the demise of Surface devices as soon as the year after next, even if Microsoft’s clear focus is on cloud and software, where the real money is generated. Maybe we’re missing something in the big fiscal picture at Microsoft, which Brazier has his finger on the pulse of, but only time will tell.